Excerpt from U.S. Coast Guard “Proceedings of the Marine Safety & Security Council” magazine. By CAPT Vince Atkins, former commander, U.S. Coast Guard Sector Honolulu, and ENS Meghan Hough, U.S. Coast Guard Sector Honolulu. Hawaii Superferry (HSF) came to Hawaii to start a high-speed ferry service between the Hawaiian islands of Oahu, Maui, and Kauai. The Superferry vessel, the Alakai, is a 350-foot high-speed catamaran designed to carry 866 passengers and 282 vehicles. Citizens and environmental groups opposed to this new service voiced several concerns, citing Alakai’s lack of an environmental impact study, the possibility of increased traffic congestion, and the potential for introducing invasive species and harming marine life. Alakai’s initial operations were greeted by an estimated 300 protestors in Kauai, endangering public safety at sea and ashore. USCG Station Kauai’s small boat is shown removing protesters on surfboards from the path of the Alakai into Nawiliwili Harbor, Kauai. The crowd forced the HSF facility to close its gates due to security concerns and, due to continuing public unrest, HSF decided to temporarily halt its Kauai operations altogether. As the courts wrestled with the legalities of the situation, law enforcement agencies had to prepare for the ferry’s possible return to full service and the subsequent widespread civil disturbances it could cause ashore and in the harbors. Federal, state, and local authorities faced the challenge of balancing seemingly contradictory objectives: upholding the law, ensuring public safety, ensuring the safe arrival and departure of the ferry in multiple ports and jurisdictions, and protecting and promoting constitutional freedoms. Information sharing was critical for successful operations, and for them to be viewed with the broadest scope—not just as an exchange among government agencies, but with the public at large. The Coast Guard; its port partners; and various county, state, and federal government officials routinely worked together on a number of committees, at exercises, and during other operational incidents to understand and align the various legal authorities and jurisdictional concerns. The mechanism that provided for information sharing and interagency alignment was a unified command structure consistent with the National Incident Management System. The Incident Command System (ICS) provides an organizational structure and process wherein agencies with differing authorities, competencies, and equities may come together to work toward a common goal. The operational challenges, varying agency concerns, and differing agency capabilities were laid bare and discussed thoroughly during the frequent meetings of the unified command. The unified command worked together to develop a plan that recognized differing authorities and competencies. The two operations/groups (onshore and waterborne security operations) created an overall plan designed to reduce the number of on-water protesters, provided a pre-designated protest zone, and developed coordinated methods to deal with illegal and unsafe protests. The coordinated plan also required a temporary fixed security zone to ensure the safety of the vessel and its passengers. The implementation of the new security/protest zone required extensive public affairs efforts to ensure the affected maritime stakeholders and ocean recreation community understood the scope of the security regulations. To increase compliance, the unified command formed a joint public information staff to meet with the public to outline security zone boundaries and explain the legal consequences of violating the zone. Public outreach proved successful in deterring a large number of protesters from illegally entering the on-water security zone. It’s important to note that the intended result of this information sharing process and interagency collaboration was not to change the protestors’ opinions regarding the ferry operation. In this instance, information sharing achieved its intended goals: allowing the Alakai to transit in and out of Maui without incident, allowing protestors to voice their dissent, and helping agencies to make the best use of unique authorities and competencies. The complexities of maritime operations are often compounded by factors such as the variability of the sea itself, differing and sometimes overlapping legal authorities, and the presence of a wide range of concerned agencies with varying competencies and capabilities. Information sharing reduces operational complexity and sets the stage for success. Interesting that your article talks about "Execution of the Operation" and "Operational Success" [on Maui] regarding a "Hostile Operating Environment" [on Kauai], but the two were different situations. HSF did not have any 'operational success' going back into Kauai, and the Coast Guard never experienced any 'hostile operating environment' on this going into Maui. The two were two different situations. It would have been more protective of public safety if the Coast Guard would or could have advised the ferry operators not to attempt an end-run against a court order and to give up on its confrontational voyage to Kauai. 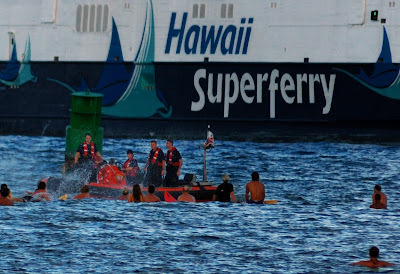 In the end, those who protested in the water as well as those who chose other methods were vindicated, and Hawaii Superferry departed for good. That could not have been known at the time of the Kauai run, but there would have been no public safety issue at all had the ferry not attempted its profoundly unpopular voyage to Kauai. Finally, the information sharing described in this article seems to have failed to differentiate between the Kauai and Maui activities. Maui never to my knowledge experienced any surfboard protests. Instead, the Maui choice was to go to court, where they were consistently successful. In the end it was shown that HSF and the Unified Command ignored a legally binding Hawaii State Supreme Court decision issued days before HSF started its first operations. Just because the Governor and Hawaii AG told law enforcement it was legal, did not make it so. The People were correct all along.